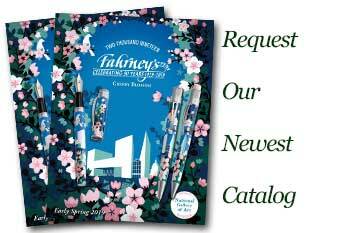 Order your Namiki Yukari Royal Frog Fountain Pen today from FahrneysPens.com. Fine Pens, Refills & Luxurious Gifts – great prices & fast shipping. Extraordinary artistry and craftsmanship, along with superior attention to detail, embody the essence of the Japanese Maki-e' art form. The exquisite hyper-realistic, animal inspired design of the Yukari Royale Frog is brought to life through the thousands of skillful touches of the master artisan. 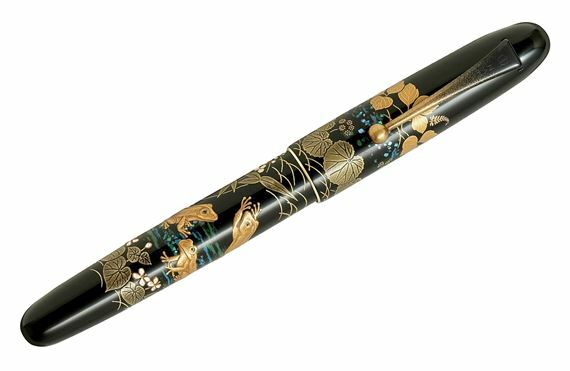 The artisan started with drawing the intricate lines of the frogs, leaves and water designs on the lustrous black Urushi lacquer surface, and then skillfully sprinkled 18-karat gold foil and powder in a continuous manner creating a dimensional, powerful and expressive masterpiece. 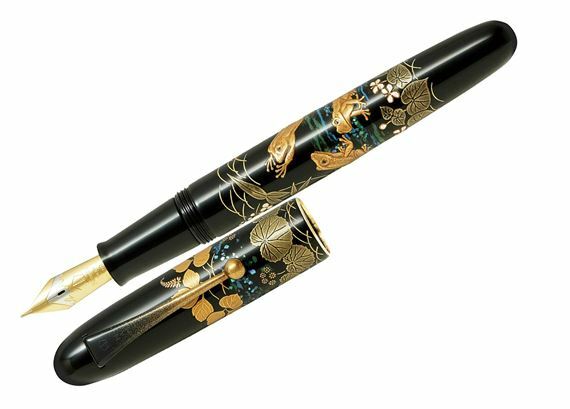 Captured stunningly on the body of the fountain pen, the artisan has expressed the passage of time by portraying a variety of flowers that come into bloom at different times throughout the year. The tranquil flow of water is expressed with luminous Raden (Mother-of-pearl) and Kawari-nuir. Also among the carefully curated scene are three golden frogs dynamically depicted moving around in a lively manner. Frogs in Japanese, also referred to as “kaeru,” are known to be a popular motif as a lucky charm that will bring health, longevity, protection and wealth. The Namiki Yukari collection features a precision 18K gold nib with rhodium accents and a piston ink delivery system, ensuring first-class writing quality and long-lasting performance. The nib also bears the Namiki logo as well as an engraving of the highest, most majestic mountain in Japan, Mount Fuji. Bottle fill only.